For the last three days, I've been able to sit down at my painting table for short periods of time late in the day to do more work on a small watercolor block painting I started in May of 2007 but didn't finish. The last painting in that series I started in early March of 2007 is here. Although I did a series of "trackpad drawings" in December 2007 and January 2008, this is the first time I have used my gouache and watercolor paints since May of 2007. Above is a detail of the still-unfinished painting tentatively titled "Conversation Between a Blue and Green Place and the Sunrise." It didn't have a working title until yesterday. Holding a brush in my hand and mixing paint with water and applying the paint to the paper on a watercolor block feels good. My sister who lives on the Gulf Coast in Mississippi asked me if I could identify this large bird. I can't. On Wednesday, after talking with my next-door neighbor who had also seen hummingbirds on her porch, I put my hummingbird feeder up. Yesterday I saw a single hummingbird on two occasions. This morning the surface of the pond is frozen again. but the bulbs on my porch are a little more above ground each day. your hummers are Anna's they dont migrate and live here all year. 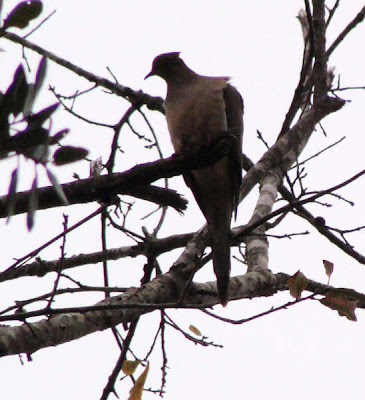 the pic of the bird is a dove, looks like a morning dove, but I cant be sure. we have plenty of them here too. The painting is quite beautiful, am. I always like when you post pictures of your artwork. I agree with dawn, I think that looks like a Mourning Dove. This whole post feels like early spring sunshine. I'm with those who think it's probably a mourning dove, though that little "topnot" doesn't quite fit. Maybe the wind was blowing a feather out of place. Nice picture. Love the way the colors transition from earthy colors at the bottom to light colors at the top. Love the work in progress, am. Always enjoy your use of color. Thanks to everyone who identified the Mourning Dove for my sister. kjm --Thanks for your appreciative comment on my still-unfinished painting. It's on the wall above my painting table, waiting for me to decide if it's complete or not. It was good to have a chance to read some of your poetry in your book "Home & Away: The Old Town Poems." Especially the ones on pages 7, 12, 45, 50 and 74. I like what you do with words and vivid images. Dawn -- Thanks so much! robin andrea -- Thanks for your ongoing encouragement. Zhoen -- Yes. That's what it is. The outside is still catching up to the inside. Loren -- I wondered about the topknot, too. Thanks for your comments on the painting. R.L. -- "Tourterelle triste." Thanks for the words in French and your kind words about my painting. rbarenblat -- Thanks for stopping by to see my painting!